Colors play a tremendous role in the food industry. Any chef will tell you the visual importance of color combinations when plating food. Vibrant colors are a generally accepted indicator of great taste, and when it comes to advertising, especially online food marketing, colors are indispensable. This is certainly true where your pictures and images are concerned, but what about the rest of your web design? Does it really matter what colors you choose for the different elements on your website? Indeed, the answer to that question is a resounding ‘Yes! According to DesignAdvisor, 93% of shoppers report visuals as the number one factor influencing their purchase decisions. Studies have shown that different colors tend to affect the human psyche in different ways, often on a subliminal or subconscious level. This effect can have an impact on moods, attitudes, and emotions, which in turn lead to corresponding actions and behavior. So what exactly are these messages and meanings, and how can you use color psychology to give your online food marketing a boost? Let’s have a look at seven of the most prevalent colors and how they may or may not be suitable for your food-related industry. Red is a feisty color and one patently suited to the food sector. It sends a message of passion and energy, while also suggesting speed and urgency. As a matter of fact, some people even experience an increased heart rate when they see the color red. If you’re in the business of selling fast food, red is a great color to utilize. After red, yellow is the next most popular and effective color where food branding is concerned. This bright, cheerful, energetic color is even purported to stimulate hunger pangs, which is ideal when you have something delicious on offer. Spread some warmth and joy while you satisfy your customers’ needs. Another warm and energetic color, orange gives a message of confidence, ambition, and enthusiasm. It symbolizes creativity and youthfulness. It works well for technology and healthcare brands but is not quite as sought after in the food industry. However, before you discard orange altogether, bear in mind that it can be very effective as the color for your CTA button. Although blue is the most common favorite color worldwide, signifying peace, trustworthiness, and tranquillity, it is not particularly popular in the food sector. This is largely due to the fact that there isn’t an abundance of blue foods found in nature. You might be able to use it as an accent color though, or for one of the less prominent elements of your web design. Green is the color of nature, growth, and health. It gives a feeling of freshness and is a calming, relaxing and soothing color. Green is an excellent choice for food-related companies, especially health conscious ones, focused on organic and environmentally friendly products. There’s something sophisticated, royal, and even mysterious about this rich and beautiful color. Although it is exceptionally well suited to the health and beauty industry, it can also be used to full advantage in the food sector. This is especially true if you have an upmarket or exclusive range of delicacy products. Purple also combines well with other colors, creating a striking effect. No doubt about it – pink is pretty. Pink can be put to good use in certain niches of the food industry. It is a warm and sensitive color which sends a message of sincerity, respect and nurture while also evoking feelings of opportunity and possibilities. Now that you have these color psychology insights, it’s time to take a good look at your web design and see where you may be able to make a few changes to help enhance your message. Check out this color psychology infographic for more facts and stats to help you spice things up and generate more conversions for your business. ​For as much as I’ve studied, taught, and written about both business and self-management over the years, up until recently I’d hardly paid a coffee cup’s worth of attention to the ways in which beliefs were impacting my world. In the course of Parts 1, 2, and 3of the books that make up the Zingerman’s Guide to Good Leading series, I’ve covered mission, vision, values, culture, Servant Leadership, self-management, creativity, anarchism, and a whole lot more. At ZingTrain our training business, we teach 9 different two day seminars on leadership and organizational development. And yet it’s only in the last few years that beliefs are finally getting their just due. It turns out that I’d “discovered” a major player in the drama and dreams that make up my life, both personally and professionally. It was as if I’d been focusing on the play itself, the lines of the script, and the way actors sounded from the stage, but altogether ignoring the playwright who wrote the words and set the stage—literally and figuratively—for them to all be there doing what they do. What changed when I began to dial into the details and depths of what I believe, and to look into what others around me believed as well. It blew my mind. And it’s already having a big impact on our organization. 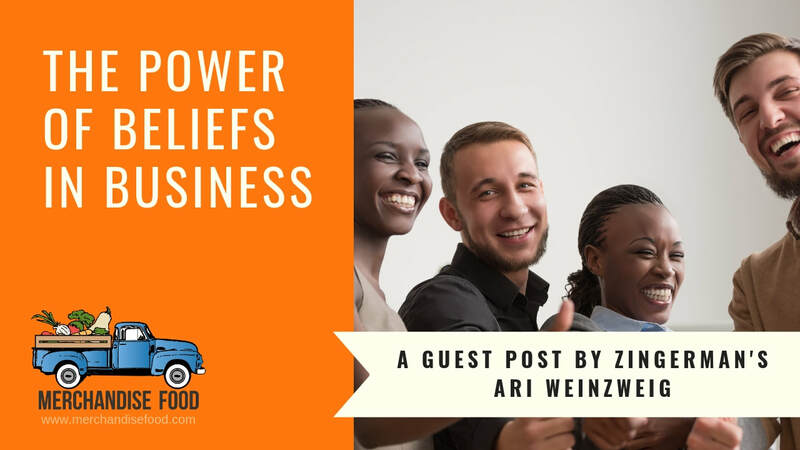 Although they don’t have their own line on the balance sheet, beliefs abound in the business world. But since few of us actually acknowledge them for what they are, or understand their import, they’re essentially invisible. Beliefs, though, are where almost every action, conscious and unconscious, begins. Whether we know it or not, our beliefs create—for better and for worse, for richer and for poorer—the complex reality in which we struggle to succeed every day. a) In the course of researching for the book, I started to see beliefs in three broad categories. Negative beliefs, neutral beliefs and positive beliefs. Negative beliefs create negative outcomes. Neutral beliefs don’t do a whole lot. Positive beliefs create positive outcomes. You simply can’t get positive outcomes out of negative beliefs. You can generate a lot of short term energy out of negative beliefs. But in the long run the energy that emerges from negative beliefs will either just flame out and die, or keep us trapped in back and forth, no-win, cycles of pain and emotional violence. A great healthy sustainable organization, I started to realize, can only be built on positive beliefs. b) We can change our beliefs!! That’s right, we can choose what we believe! Once we know we have beliefs, become mindful of what they are and understand how much impact they’re having on our lives, we may likely realize—as I did on my many subjects—that what we believe is creating a lot of the reality that we often don’t like. And that the most effective way to change our daily reality is to not to try to get others around us to change, but to look inward, to change what we believe. About ourselves, about the people we’re frustrated with, about the world. Two other subjects covered in the book are also big contributors to organizational culture, health, engagement, and effectiveness. Hope and the spirit of generosity. Each is essential to building a healthy, caring, sustainable organization. 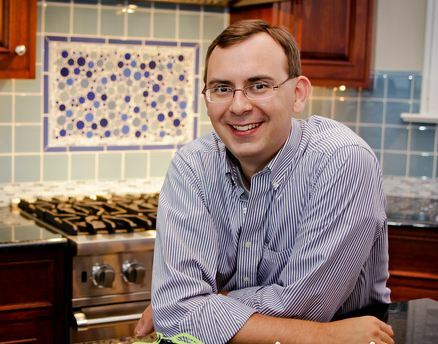 And, of course, because we’re a food business, the book also includes a dozen or so recipes to use in your kitchen. A Tunisian couscous with octopus and harissa. Our challah bread from the Bakehouse. Chocolate-dipped-espresso cookies from the Bakehouse, and more! We hope this simplistic D.I.Y. 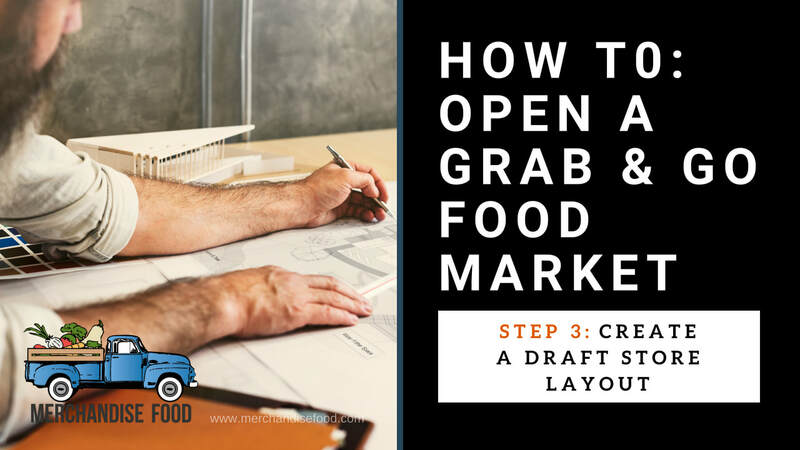 overview helps you plan the initial stages of your grab & go food outlet. 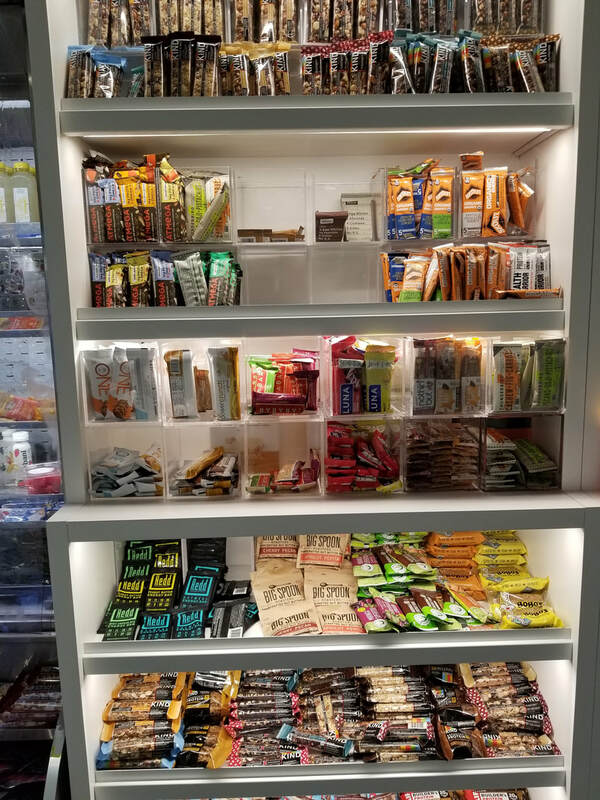 A successful opening also includes point of sale technology selection, packaging, pricing, labeling, and plan-o-grams, opening merchandising, training, etc. Many of our clients find that involving our expertise in the planning process or simply outsourcing work to our firm helps them open, revamp or maintain markets with greater potential. Merchandise Food can help! the right type of equipment to suit your retail vision. 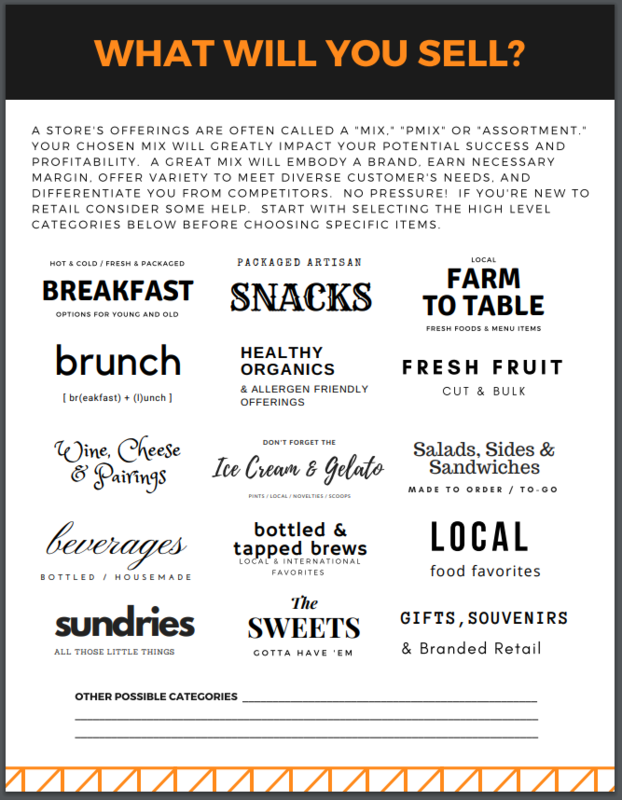 ​Let the Shape & Parameters of your Space Guide You: The size and shape of your available store footprint and common retail industry best practices we've all seen and experienced shopping can help to guide your layout process. Start by obtaining an architectural drawing of the space or creating a basic layout on graph paper yourself by taking accurate measurements with a tape measure. ​Use Product Offering Categories to Guide your Layout: Once you've framed the space, start to plot or sketch product categories into areas of the store. If items are generally merchandised on dry shelves or refrigeration, note these areas on the map and the product categories envision there. Continue the process until all your food service programs and product categories have a "home." Remember to include space for seating, aisles, queuing, food production or assembly. Brainstorm and play around with different options. My might get to a good basic layout after 5 attempts or even 20. Remember your concepts are not an architectural plan headed to the construction team, but more an inspiration to guide early planning and conversations. Hopefully with the added input of your project team, the layout will change and be molded for the better as other perspectives are considered and included within the plan. Request & Accept Outside Advice Where Needed: There's likely information or factors outside of your knowledge that might tweak your draft layout down the road. 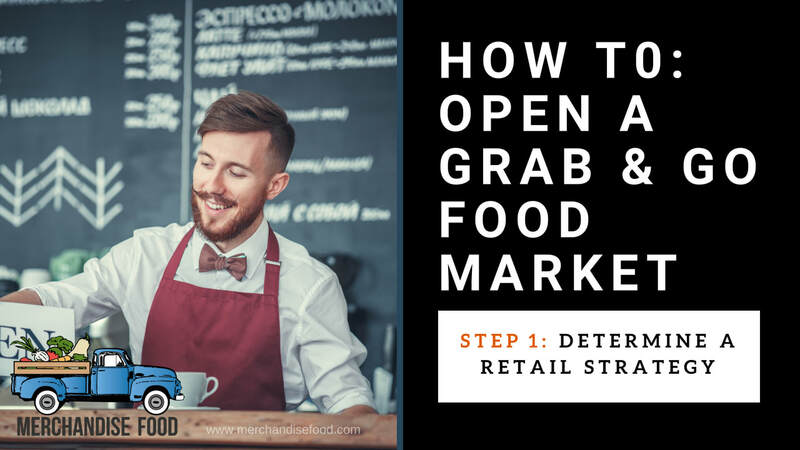 If it's not available in-house, gain retail expertise to optimize your available footprint and vertical space to influence higher future sales after opening. Don't settle for a basic layout that misses opportunities. Let Merchandise Food help you consider "outside of the box"
methods to optimize your available space. 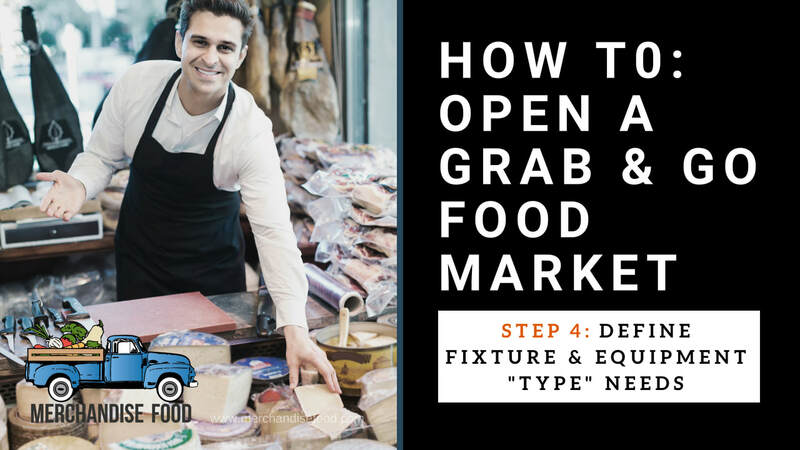 Grab & go food markets offer a timely, on-trend, opportunity to profit for your hotel, resort, or retail food store. 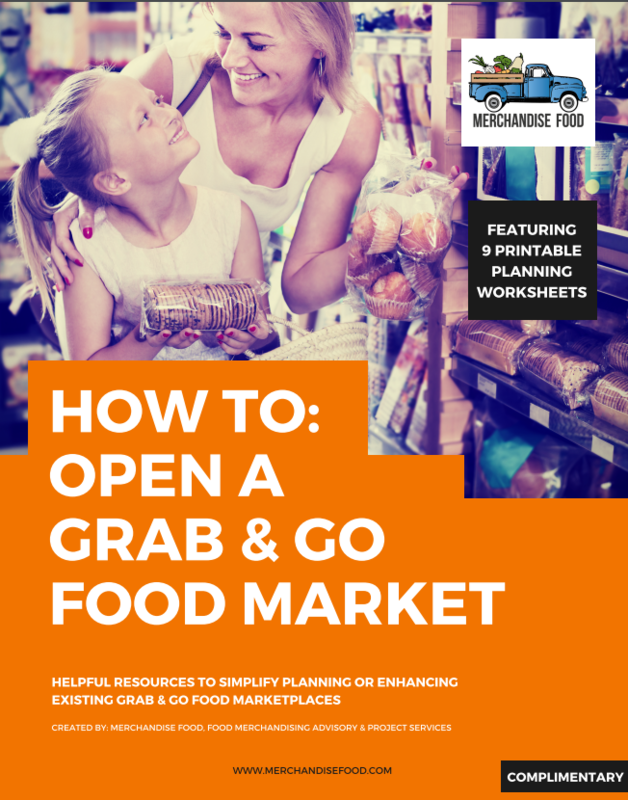 However, the potential success of a grab & go food marketplace is heavily tied to successful planning, retail strategy, optimal use of space, and profitable product assortment. In the design world, many designers request a "creative brief" to summarize and create a framework guide the design process. In the same way, we have outlined a simple process to define and outline your initial store vision. Many more important questions and answers will sprout from this process and a list of action items and special projects will be required to move from concept to reality. We highly suggest engaging retail expertise, a designer, architect, equipment or food suppliers and of course, your food and beverage leadership team in the process to fill in the details and offer advice to optimize space for sales performance. Use this process to get started and point your project in the right direction. 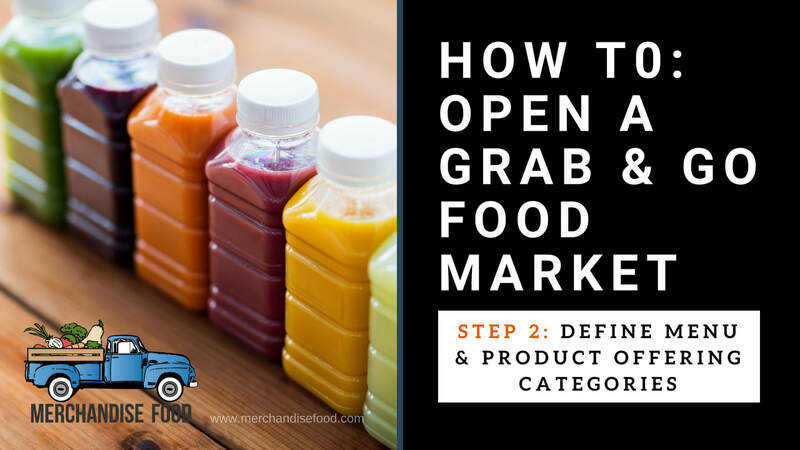 Read through our upcoming posts to learn 4 steps to build a grab & go market vision. These steps will help you more clearly communicate your service & operations plan, merchandising approach, equipment needs. While much more ​work is to be done. About Merchandise Food: Many retailers lack time, merchandising & retail expertise to reach their potential. We pinpoint issues in existing sites or future plans and advise your team or implement projects & in-store solutions for you so you can have more unique, beautiful and profitable spaces. Acme @ Union Station Denver: Food concept and merchandising excellence! 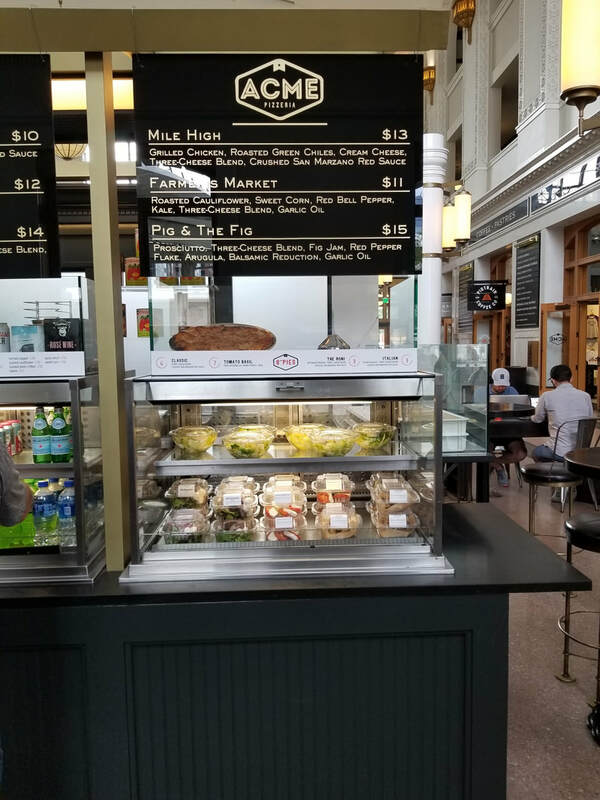 The next time you visit Denver check out the foodie experience and merchandising seen at a nicely curated mix of food concepts at Union Station. Check out ACME for beautifully presented sandwiches which nicely visually highlight their fresh ingredients. Attention to detail abounds in this little outlet packing a great visual food experience. Menu items are well signed and labeled aiding the guests' shopping experience. 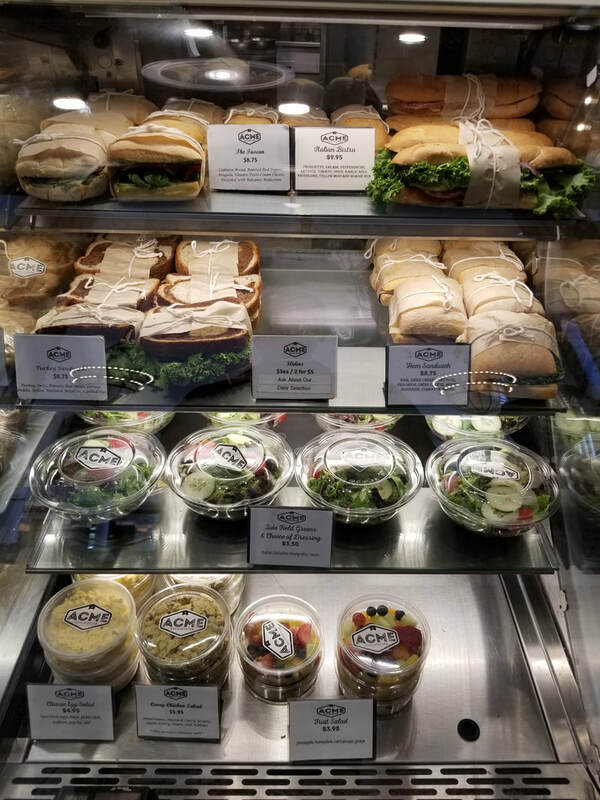 A nice little sandwhich or bagel dressing bar adds a fun element and interactive experience to customize menu items to order. 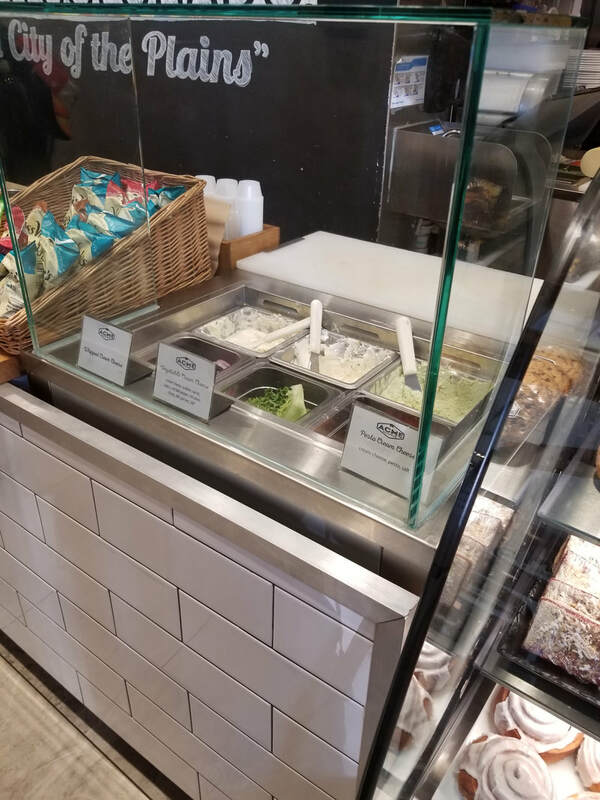 The Acme Pizza Concept is beautifully laid out and features good looking fresh examples of pizza menu offerings accompanied by grab and go formatted salads, sides, beverages and packaged snacks. This unique little food kiosk packs a lot of punch and high quality food merchandising with their freshly prepared made to order foods! Great job ACME and our food business success wishes! 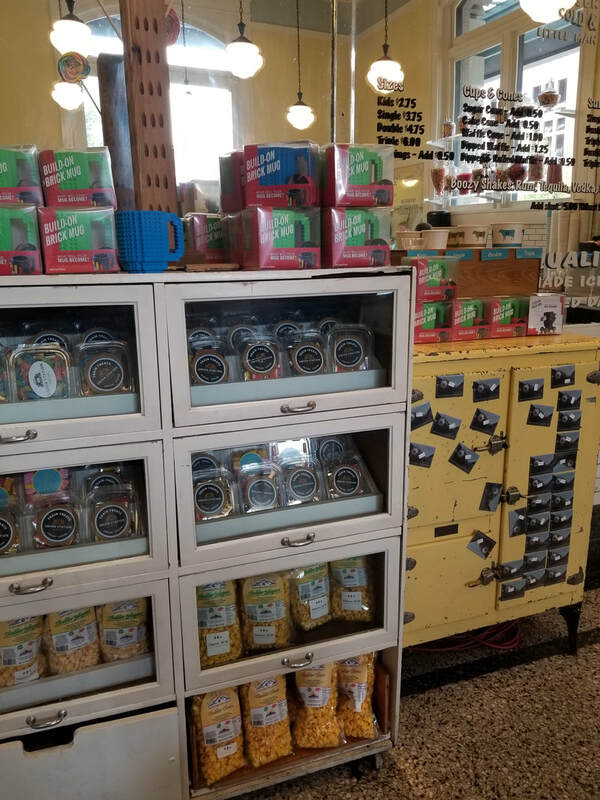 Branded Snacks and Destination Souvenirs are highlighted in a unique retro lawyer case and metal cabinet. 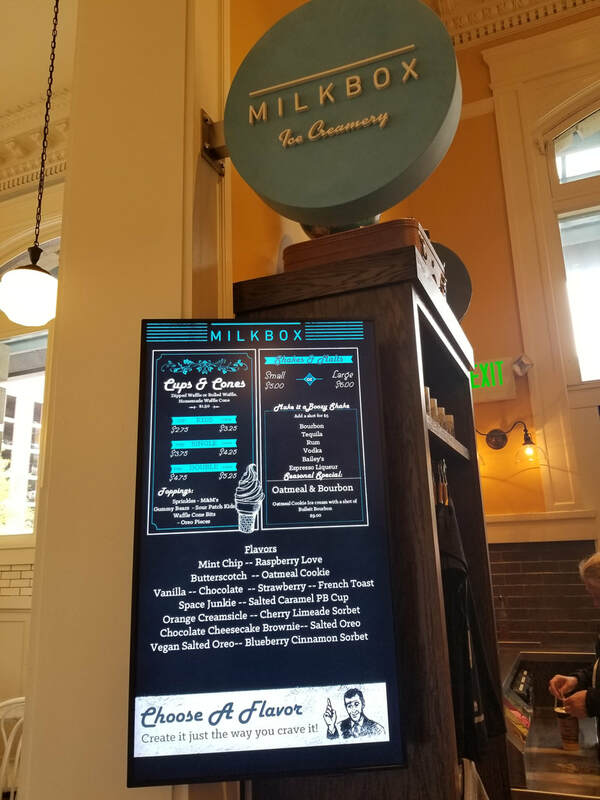 Digital menu signage features retro graphics and cues guests at store entrance to foster decision making at the register. Fun and colorful overhead signage draws attention. Brand wrapped chest freezer displays pints with nicely designed pricing signage prompting "to-go" business. I really enjoyed my visit and black raspberry ice cream with brownie chucks in a fresh waffle cone. I hope to be back soon! 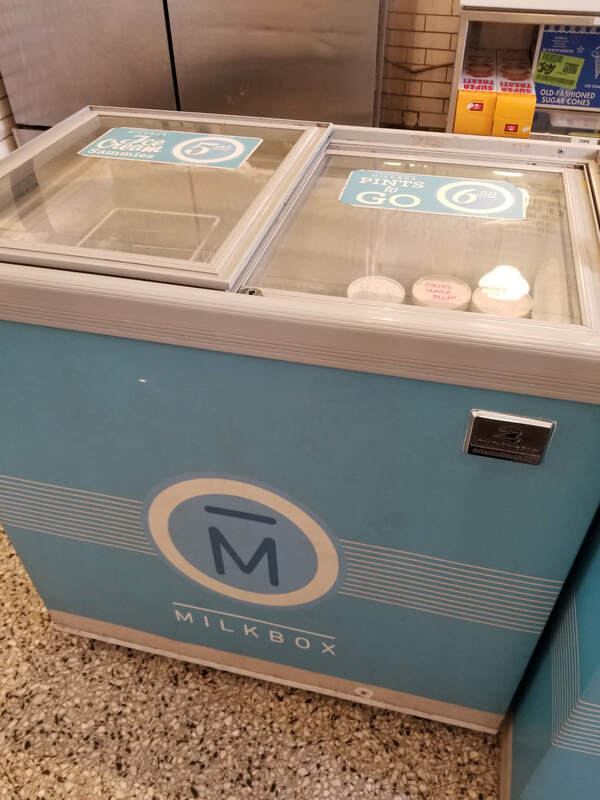 Great job Milk Box with your intentional in-store food merchandising efforts! How to use acrylics in food merchandising displays. Clear acrylics can play an important role in food merchandising. A key attribute is their high impacts product views often lost with other merchandising vessels such as crates, baskets or metal containers. These units can be great for displaying hard to merchandise objects that do not stand upright on thier own such as candy or energy bars. Acrylics come in a variety of shapes and sizes from single cubes or cylinders to on counter tiered impulse displays. Often seen at register areas acrylics can provide a great way to containerize small $1 to $6 objects prone to be purchased at check out. The photo above shows a technique to fill empty shelving gaps using colorful products in clear cubes.